In 1990-1991 we had a bunch of eggs on our farm. We had so many Ostrich, Rhea, Duck, Goose and Emu eggs~I took a class at a local Art Institute and learned the art of pysanky. It was love at first "art"!! 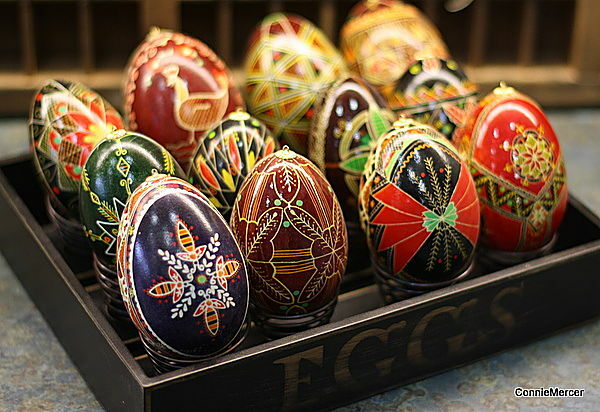 The Ukrainian people are famous for their colorful "Pysanky" Easter Eggs. 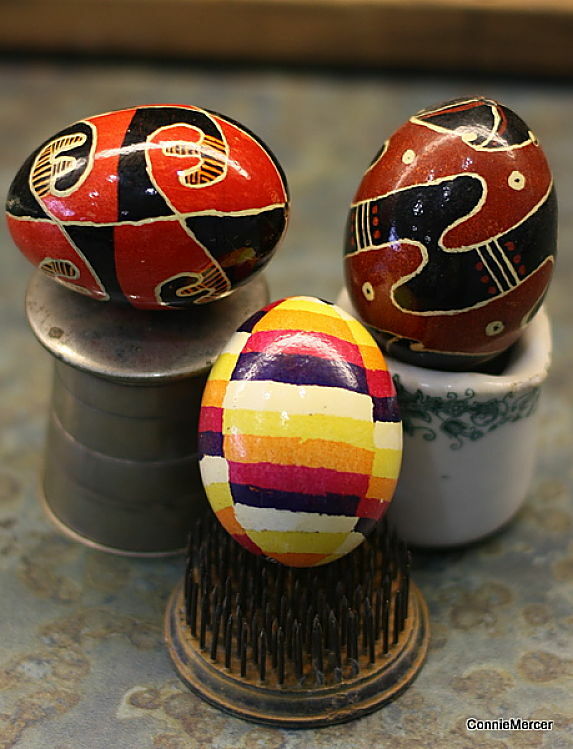 Pysanka is a form of egg decorating using a wax-resist method. Legend has it that as long as Pysanka are decorated, goodness will prevail over the earth. 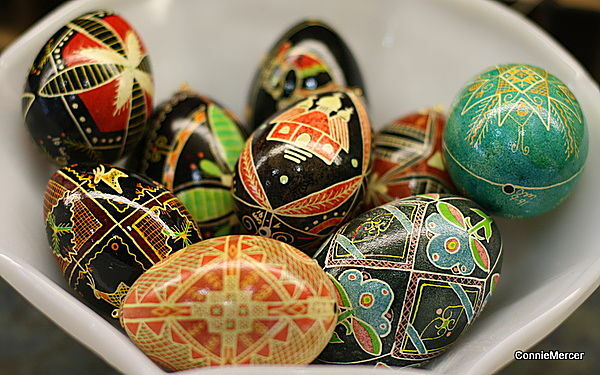 The supplies needed in making Pysanka are eggs(goose are the best), kistky(writing tool), candle, beeswax, dyes, spoons, egg rack and a working area~your not afraid of getting dye and wax on. I am going to give you the short version of the process~make sure you are working with a clean egg~no marks or scratches. Right from the bird is the best! 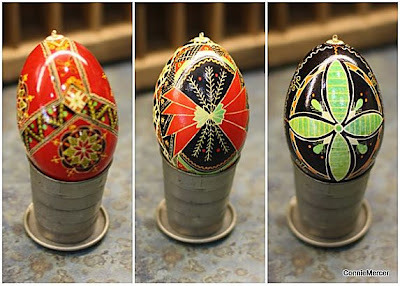 Mark your lines on the egg using an egg lathe or by hand. Use the kistky to apply the beeswax to the egg. Dip your egg into one color of dye ~then repeat the process. 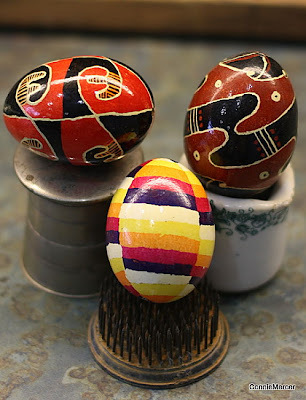 Apply lines on the egg, with a soft lead pencil, go over the lines with the kistky(holds the hot beeswax)~when that is done you are ready to dye the egg a second color. You keep adding color until your entire egg is covered in beeswax. This is the fun part. Take your egg and hold it gently over the candle fire~the wax will start to melt off and you will have a beautiful colored egg. Take a soft paper towel and wipe all of the beeswax off. The next step is to varnish the egg ~using your hands. Place the egg on the egg rack to dry~they look stunning in a glass tumbler or large glass bowl. These that I have shown you are a mixture of Duck, Turkey and Goose eggs. These are Rhea eggs~we were raising the birds at that time so eggs were plentiful!! Over the years the vibrant colors have faded but they are still beautiful. All of the hours****sigh****that I sat and did these~time will spent!! 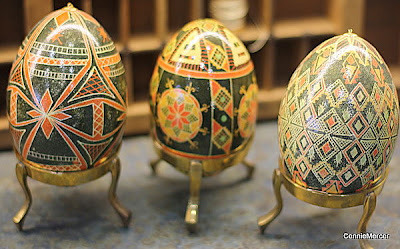 My story is not complete without showing you these eggs..They were done by my oldest son~he was a sophmore in high school and he made his own patterns for the eggs. It tickled me that he took interest in another one of my crafty endevors. Hope you enjoyed this post ~ please let me know what you think about my blog content. I have posted a blog poll and encourage you to vote!!! Have a fabulous Tuesday~I know I'm early!!!! You've been hiding some of your talents. AWESOME eggs. 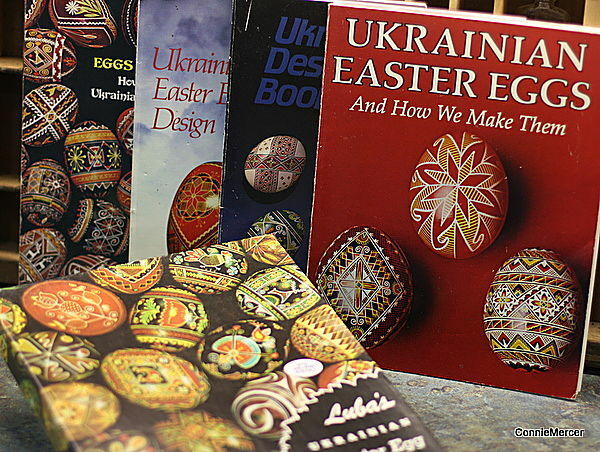 Russia and former USSR countries have a similar art form with eggs. I would love to try my hand at these. holy moly woman you are talented!! Those eggs are absolutely beautiful. Ummm WOW WOW WOW! those eggs are fantastic... Love them!! I am in AWE! These are BEAUTIFUL!! WOW!!!! These are just beautiful! Thanks for sharing these! wow! you've been hiding your talents and you have a gifted son. those eggs are awesome. i love your blog as you have a wide range of eye candy!!! Oh these are just AWESOME...so much talent you have!! :) Love this! Love those eggs. Amazing and beautiful! Those eggs are beautiful - you are a true artist - They remind me of Faberge Eggs , and I think they must be a European tradition for Easter? Beautiful! My husband's maternal side is Ukrainian, so I always enjoy seeing things from their culture. BEAUTIFUL! That is such an amazing talent!! Ok, this is cool! How do you have the patience to do this? I love the designs and how intricate they are. Very awesome! These are so cool! They are intricate and just beautiful! Wow, these are gorgeous! I wish you could come and teach my crafts group how to do this...we are still novices (but did enjoy trying out the technique recently!). How cool that the eggs you decorated were from your own birds! I have always wanted to try pysanka! These are gorgeous. I'm so impressed. Connie, these really are gorgeous. How long would you say it took you to create these? Such beautiful pysanky eggs, thanks for sharing your artistic talent. Try it Tuesday~just for fun! Ready, Set, Create Magazine ~ is ready today!!! !